Disclaimer: Please do not leave comments on the blog or send me mails if are looking for a job with radio meow.I do not work for Meow, also I dont know any one who works for the station. I have just written this post as a listener. Last week in Delhi, I noticed interesting billboards of a new radio station “Meow – India’s first only for women radio station”. 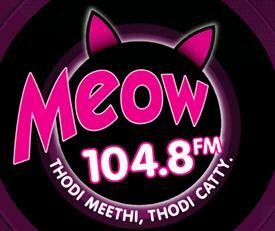 I was curious so tuned in, since that time I was clued on to MEOW, during my stay in Delhi. Its a wonderful station with lots of good discussions and very less music (for a change). Audience participation is very high and the quality of RJ’s is exceptionally good. Discussion topics are very relevant, many times me and my wife start our own discussion on the same the topic, that lasts longer than the program. The shows are well created and range from “tu-tu meow, meow” to “meri meow”, etc. The best part is that when ever a caller calls the RJ says “Hi, Rajesh, Meooow to you” and they way they say its so infectious and funny that most callers start by saying “Meoooow”. There is such a masti in the saying “Meow” I guess that frees the caller of all inhibitions and that brings out bindaas opinions and thoughts; which gets reflected on air..
Good to see a different type of channel.. radio in India is just starting to take shape, good job Meow team… hoping you seeing you (listening i mean) in other cities as well. I read your postings in this blog.Your currage and success is some thing to follow. Really nice read. Seventymm has many challenges ahead of it. Its major challange is PR. PR is here member relation and media relation. How to inform about your library of stock is more important. Newsletter is another important thing to look at. Buzz marketing is need of the hour for you and you are there. But it has to be nore solid. I wish you all success in all your ventures. My sister wants to know how and what is to be done to be a radio jocky for RADIO MEOW. I could’nt find any contact details. Can you please help? I would like to be a Rodio Jockey on Radio Meow 104.8FM. I am very enthusiastic girl from mumbai, and currently I have completed a radio jockey course from XIC (Xavier institute of communication), as a part of theatre group of mumbai I am very good in voice modulation and voice culture. Kindly call me for an audition. It takes me great Pleasure to introduce myself as Kanchan Gunele. I have attended 15 days workshop on Radio / TV Anchoring / Radio Jockey /Voice over Dubbing / conducted by NRAI School of mass communication. I would be highly obliged if you would accept my candidature for the above said post, attached with this covering letter is my detailed Resume & a Photo. If required a Video demo tape of mine would also be produced. Date of Birth:	22nd May 1979. Hobbies	:Singing, Anchoring Mimicry, Painting and Reading.Scrip writening, acting. hi guys i m sachin, i like vry much this meow show on 104.8 fm and mostly the goship and funny jokes they do to each other..
My hobbies are……listning and singing,singing,singing,singing,singing,singing,singing,singing,singing,singing,singing,singing,singing,singing,singing,singing,singing,singing,singing,singing,singing,singing,singing,singing,singing,singing,singing,singing,singing,singing,singing,singing,singing,singing. myself Ritu. nd i jst wanted to says meow rocks! nd i m desperately wants to b a part of it. i jst wants to b a part of it. i don`t have any qualification for radio jockying but one thing what i have is… confidence. hilla ke rak dungiiii…….. please do something for me ……. I have finished My MCA….sorry ! wrong choice hahaha but kya kare i just love talkin na……last yr onlyi finished off wid my master degree….currently working as a software engineer..
have done courses is anchoring…..
i am mamta..i am interested in workin in a radio station..i can be an RJ coz my voice is soothing and appealing..also i m a trained singer.i like interacting wid people and m gud at holding attention. 4got 2 mention- (if ne of dis even makes a difference)i have just completed my b.com wid a 1st class.. I like meow very much.I listen it almost daily. I like meow RJ’s very much. Please carry on this performance. hi,this station is really crative idea.i appreciate ur programme as a listener.so this blog is also a nice medium of convey ur thoughts.keep this sprit.have fun & spread to others.i m a copywriter in fm staton and i really admire ur idea.keep rocking. HI I LOVE MEOW STATION U KNOW WHY….?…. BECOZ IT HAS REALLY GOOD HUMOUR…..AND I HAD MY LOVELY SMARTY CAT….. AND SHE ALSO DO MEOW……I REALLY WANT TO BE A PART OF MEOW STATION LET ME IN……..AND DON’T BE SCARED YAAR NO ONE WILL GO OUT……..DO ME A FAVAOUR MAKE MY CAT YOUR MASCOTT………. GIVE ME ONE CHANCE……AND THAT WILL BE ALL FOR ME……..
i realy want to give you lot of thanks as this is India’s First Radio Channel for womens which is deal with such good topic …i specialy waiting to listen voice of SHARDUL,ANKIL & MANISHA they are realy so good the way they handle the subject ,all listners,topic ,etc its kind of DIl Ka Risha to all of them i am one of the recent listner & Big Fan of Shardul & Anil’s Voice. I`m interested to pursue my carrer as a radio jockey please show me the way…. hey this is ragib,i m a professionalanchor n doing achoring for last four years, n i m very keen to join ur radio station. hey this is ragib from delhi i m an anchor by profession and doing anchoring for last four yeas.i m very keen to join your radio station,coz i fully aware of my capabilties,during the live shows i heard that people wants to listen me when i start speaking,i work with T.Vchannels like zee t.v,e.t.c and e.t.c punjabi as well,sony,bindass,star plus etc. as well as i worked with many reputed and branded companieslike a.h.a,pepsi,coke,lee-cooper,ritu wears,idea,airtel,vodafone,samsung,sansui,lg,bplsony,tata’s many brands like cars etc,i too worked for mostly f.m channels like radio city91.1,92.7 big f.m,93.5 red.fm,94.3 station for the fatafatgen.98.3 radio mirchi etc birthday parties,bank branch launches like icici,citi financial,abn amro,h.d.f.c bank and etc and i can be a good radio jockey if you give me a chance.i will not dissapoint you.waiting for a positive reply. To work long term, with a progressive organization where, I can use my skills and knowledge to achieve organizational and personal goals. 	I have ability to understand the problem in very short time. 	I can work in individual environment as well as in team or groups. 	I can make good public relations. 	I have the ability to solve the problems in better way.  can perform multiple tasks at same time. 	I can learn new things in very short time. Working in radio awaz FM 106 as production Manager last two year to date.